In the field of media production, TV and broadcast organisations have yet to fully realise the benefits of Software as a Service (SaaS) especially as part of their day-to-day operations. However, there is no reason media professionals should have to settle for using outmoded or inefficient technology to get their job done. There are many SaaS solutions available today that are built to support enterprise demands and some that are even tailored to the specific needs of media organisations. Although many people are using SaaS solutions, there are still some people asking the question of what exactly is SaaS. Most people are familiar with using software thats been installed directly on your computers desktop or on a network server. However, many software providers have moved to a SaaS delivered solution where users are not required to download software onto their computer or network, they simply access and use the software online. In this case, the software is fully hosted by the provider so the end-user doesnt have to worry about software maintenance and updates and they can focus on their core business. SaaS also gives users the freedom to access the tool using the device of their choice including a smart phone, tablet or other mobile device. While the definition of SaaS is relatively straightforward, there are differences you should consider to find the right solution for your needs. First, its important to determine if the solution has been built for the cloud (also referred to as cloud formed or cloud born) versus a cloud washed solution. With a cloud washed solution, the application resides and is available from the cloud but its not fully hosted by the solution provider and as a result you dont get the full benefits of the cloud including scalability, rapid innovation, high availability and most importantly ease of use and deployment. With cloud washed solutions, you also still have the operational overhead of maintaining that software just in a cloud environment rather than an on-premises network. As the market has evolved over time, so has the delivery of SaaS. Its not as black and white as it once was. There has been the emergence of another variety called hybrid SaaS. Hybrid SaaS solutions usually combine a cloud-delivered component with a private network component (on-premises or in a private cloud). This allows the user to have more control over their deployment. One example of this would be where the solution provider would host the softwares user interface and functional elements in the cloud, and the data component would be hosted on-premises or in a cloud instance managed by the client minimising risk and still reducing operational overhead compared to a full on-premises solution. Hybrid SaaS solutions are quickly becoming the option of choice for media organisations because unlike traditional SaaS solutions, the hybrid SaaS approach enables users to store their content or data in the environment they prefer. In an industry where content is your business, ensuring that you have control over your high value content is critical. However, content does have different grades of value. This makes hybrid SaaS even more appealing because it gives you the flexibility to leverage the most appropriate storage location for your content and your business. And with this flexibility comes savings in both infrastructure cost and human resources. 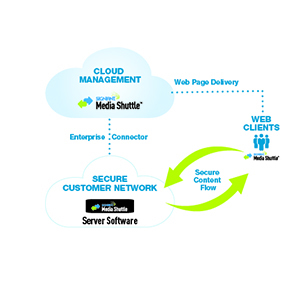 Media Shuttle from Signiant is one example of a hybrid SaaS solution that enables media professionals to quickly and easily share content, without giving up the control and security thats critical to their business. As you are looking for the right solution for your organisation be sure that your provider gives you the flexibility and control you need, the solution is built with the media business in mind, and the solution is a true cloud formed solution so your organisation will gain the most benefit from your investment. To learn more, visit the Signiant website to download the white paper, ‘Hybrid SaaS: the New Way to Move Media’.